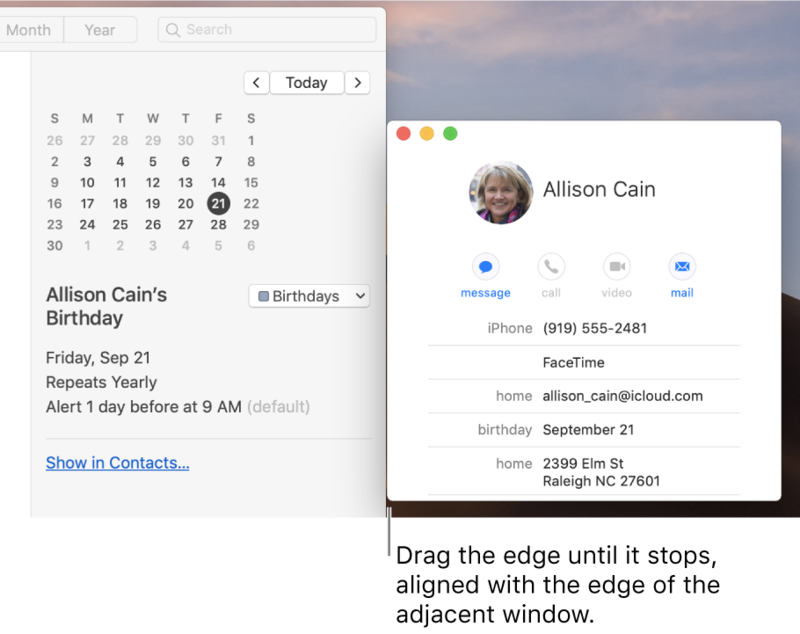 When you open an app or the Finder on your Mac, a window opens on the desktop. Only one app at a time is active; the name of the app (in bold) and the app menus are shown in the menu bar. 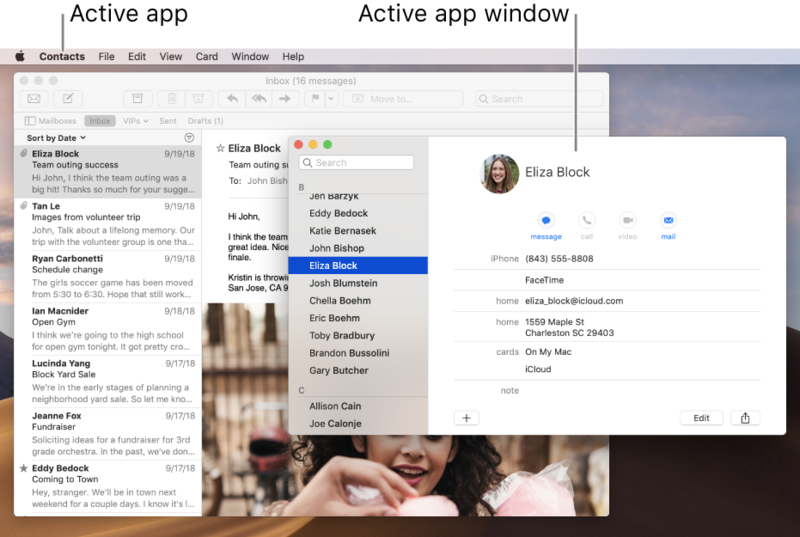 Some apps, such as Safari or Mail, let you open multiple windows or different types of windows at the same time. macOS provides several ways to manage open apps and windows. Move a window: Drag the window by its title bar to where you want it. Some windows can’t be moved. Align windows: Drag a window close to another one—as the window nears the other one, it aligns without overlapping. You can position multiple windows adjacent to each other. To make adjacent windows the same size, drag the edge you want to resize—as it nears the edge of the adjacent window, it aligns with the edge and stops. Merge an app’s windows into one tabbed window: In the app, choose Window > Merge All Windows. To make a tab a separate window again, select the tab, then choose Window > Move Tab to New Window, or just drag the tab out of the window. See Use tabs in windows. Maximize a window: Press and hold the Option key while you click the green maximize button in the top-left corner of an app window. To return to the previous window size, Option-click the button again. You can also double-click an app’s title bar to maximize the window (as long as the option to do so is set to “zoom” in Dock preferences). Minimize a window: Click the yellow minimize button in the top-left corner of the window, or press Command-M.
You can set an option in Dock preferences to have a window minimize when you double-click its title bar. Most windows can be manually resized. Drag the window’s edge (top, bottom, or sides) or double-click an edge to expand that side of the window. Switch to the previous app: Press Command-Tab. Scroll through all open apps: Press and hold the Command key, press the Tab key, then press the Left or Right arrow key until you get to the app you want. Release the Command key. If you change your mind while scrolling through the apps and don’t want to switch apps, press Esc (Escape) or the Period key, then release the Command key. In a window on your Mac, click the red close button in the top-left corner of the window, or press Command-W. If an app can have multiple windows open, such as Safari or Mail, closing a window does not close or quit the app. To quit these apps, click the app’s name in the menu bar, then choose Quit [App]. See Quit apps. You can hide or quit the active app by pressing Command-H or Command-Q. You can use Mission Control to quickly arrange open windows and spaces in a single layer to easily spot the one you need.